I bought a new 160GB hard disk last month and had to reinstall my licensed Windows XP. When I tried to activate my installation online, it always produced an error message saying that it couldn't activate my Windows at that time. I put it off since there was a 30 day trial period. I may have forgotten about it until Windows alerted me earlier that I only have 9 days remaining to activate. And so I called Microsoft Philippines Customer Support at 672-7272. I'm very much used to calling customer service for my credit card. I've occasionally called some other customer service hotlines for product support, inquiries and the like and the conversation usually goes back and forth from English to Filipino and Taglish at times. I don't mind. I just been accustomed to it. It's my first time to call Microsoft Philippines though. I've visited their offices in Makati City twice during digitalfilipino.com events that were sponsored and hosted by Microsoft. So since I knew they had a country office, I assumed the Microsoft customer service I would be calling was just a few kilometers away. After going through a series of computer-operator assisted questions by keying in my preferred options, I was finally redirected to a customer support personnel. After the usual greeting, I was surprised that the lady asked which country I'm calling from. It seems I had been redirected to their customer service located in another country. She had a British accent and I was caught offguard and immediately switched to International comprehensible & perfect English speaking mode. (I sometimes speak English with Filipino-influenced intonation when talking casually). 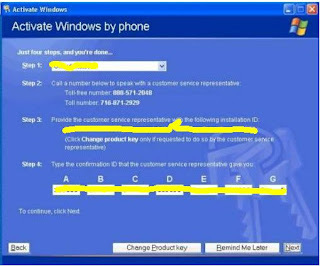 After explaining my situation, I had to give a 42 digit installation ID generated by my Windows software and after confirming the license authenticity, she gave me another 42 digit ID to input. After keying it in, it worked like a charm and produced the message that a I successfully activated my Windows product. After the call, I immediately thought it was an international call for fear of being billed for it. But I remembered that I called Microsoft Philippines local customer service number which they just forwarded. It's funny that a lot of call centers are based here in the Philippines for any worldwide support. With Microsoft, it was the opposite. I called up locally anticipating talking to a Pinoy and ended up speaking with a foreign Microsoft representative. I wonder if I chose the Tagalog option menu if I would end up speaking with a Pinoy or not.